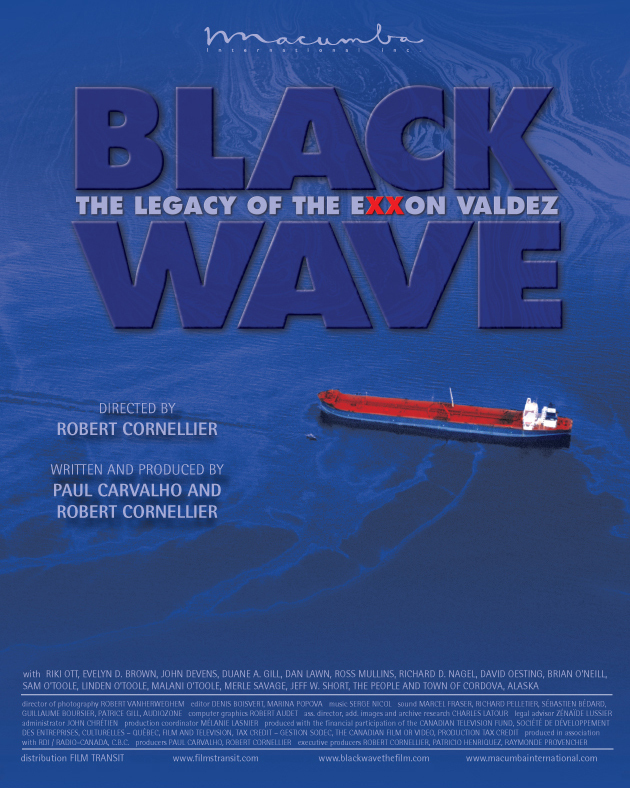 Free public screening in Nanaimo of the award-winning, Canadian-made documentary Black Wave: The Legacy of the Exxon Valdez, produced and directed by Robert Cornellier. Sunday, June 3rd, 3:00 pm at Vancouver Island University – Bldg 200, Rm 203. Film screening will be followed by a discussion with Sierra Club BC’s, Caitlyn Vernon, who will speak about the proposed Enbridge Northern Gateway twin pipelines, and the planned expansion of the existing Kinder Morgan pipeline, and the accompanying supertanker traffic in coastal BC waters. These pipelines and the increase in super-tanker traffic pose a serious threat to Vancouver Island’s beaches and waters as well as to BC’s Great Bear Rainforest, home of the Kermode ‘Spirit’ bear. This rainforest represents 25 per cent of the earth’s remaining ancient coastal temperate rainforests. 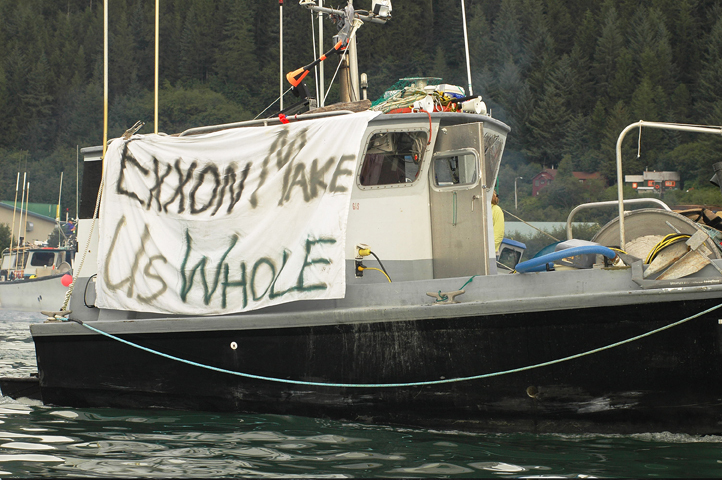 An oil spill in BC waters would change our coast forever and alter BC’s economy and lifestyle. 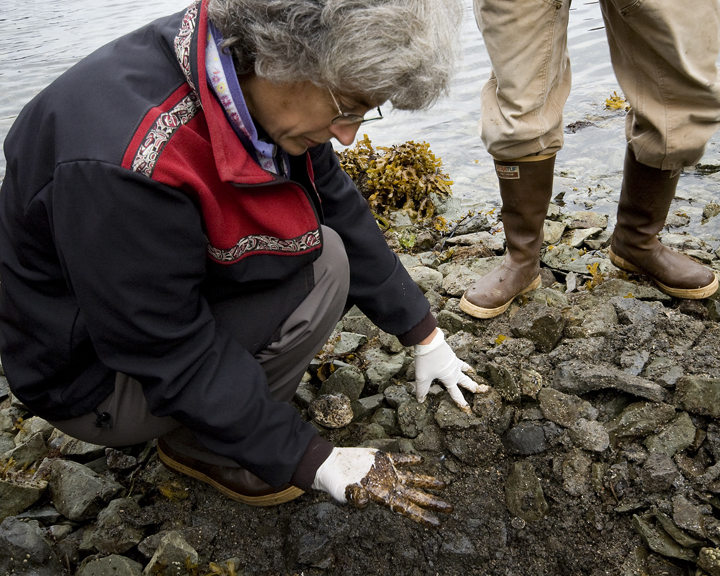 Marine biologist Riki Ott digs at a beach on Knight Inlet displaying Exxon Valdez oil 18 years later. wildlife are suffering from life-threatening illnesses, and the fishing industry has still not recovered. This is also the kick-off event forming a local Sierra Club BC group in Nanaimo. Whether you are interested in joining a group or not, come and learn how an oil spill on our coast would impact you and your family. Refreshments and discussion will follow the screening. This entry was posted in Events, Politics and tagged Enbridge Northern Gateway Pipeline, environment, Exxon Valdez, film, Nanaimo, Sierra Club, tar sands, Vancouver Island University. Bookmark the permalink.